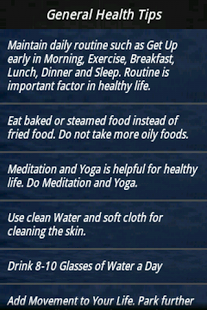 which helps to maintain and improve your health. 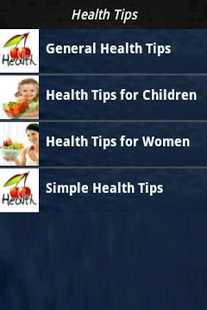 Many common health problems can be prevented or alleviated with a healthy diet and health practices.This application suggest you the right choice of food at the right time that your body needs. Health tips and nutrition tips guide you how your daily diet and health practices should be ,in simple way.Nutritional charts give the nutrition information of the food you eat.Vitamins and mineral sources will suggest you the different sources of various vitamins and minerals. 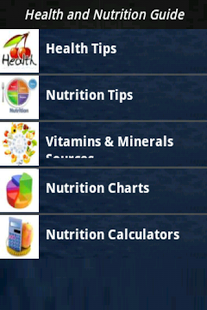 Nutrition calculator includes BMI calculator,calorie calculator and Protein calculator for your easy analysis.Thus the application assist you as complete health and nutrition guide. The application will be updated frequently.checkout for updates.